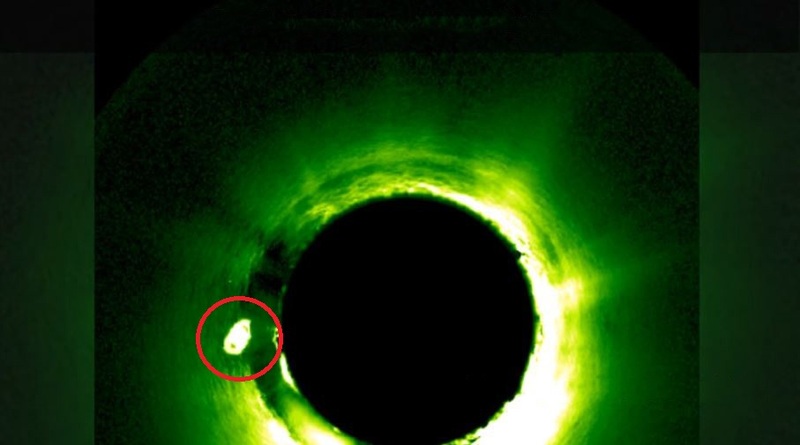 UFO hunters believe they have found another extraordinary UFO while going through bizarre images captured by the Solar and Heliospheric Observatory Images—a joint mission between NASA and the European Space Agency (ESA). The planet-sized UFO—according to UFO hunters it’s the size of Jupiter—skimmed past the sun and can be seen changing direction as it approaches the star. The ‘Mystery UFO’ is allegedly seen ‘interacting’ with the sun in this image. The video posted onto YouTube by Paranormal Crucible shows the massive UFO approaching the sun, and as it ‘crashes’ into our star, a bright flash of light is generated. According to UFO hunters, this is a telltale sign that suggests that the object we see in the video was not the result of pixelations or errors in the satellite images, but a real object that managed to ‘interact’ with the sun. Paranormal Crucible—a YouTube channel known to post different videos of UFO’s and the paranormal—suggests that the UFO may have been using the Sun as a ‘refueling station,’ as there are ‘satellite images’ which allegedly show a white spot, joined towards the sun’s surface by a connected line. Soon after the video was posted online, different users and other channels picked up the news.